One of the things that can be challenging in vegetarian cooking is creating a colorful and interesting dinner plate. I don’t mean the meal as a whole, I mean what you actually find as your main course. If you eat meat, your plate is probably something like protein, starch, green vegetable. In England they call that meat and two veg. There used to be a vegetarian restaurant in London called Eat and Two Veg which I thought was hilarious. Anyway. On our plates, that diversity is harder to accomplish. You can’t just swap out the steak for tofu. When I am making a special dinner, I try really hard to come up with a three part main course. I always have at least one course preceding the main, but I like that main to look really colorful and appetizing. I found a recipe for this wonderful couscous dish and knew I wanted to make it for my brother’s special dinner. If I make a starchy side, I try to make a protein-heavy dish along with a clean vegetable. Galettes are great for dinner parties but in this case, I thought the crust and the couscous would be starch overload. This time, I made a crustless quiche with kale and zucchini and that amazing blasted broccoli. This dish was so lovely. 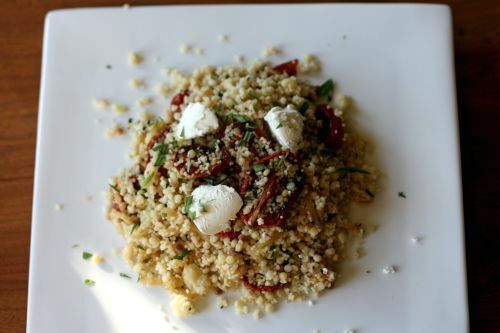 Two kinds of couscous mixed with slow roasted tomatoes, caramelized onions, and fresh herbs makes for a substantial and delicious side. The recipe instructs you to top it with dollops of homemade labneh – a type of strained yogurt cheese, but I opted out of that easy but time-consuming step. I could have probably bought some labneh, but I opted out of that time-consuming third stop on my grocery shopping tour and just bought fromage blanc. Really, after tasting the dish, I would probably use something more pungent next time – like a Montrachet or even feta cheese. If you make this as written, you will end up with approximately one ton of couscous, so it would be a great addition to your next party or potluck. Never a bad thing. I know this seems like a crazy amount of tomatoes, but just make them and use them in other things if you don’t want to add them all to the couscous. They are delicious. Preheat the oven to 300ºF. Arrange the tomatoes halves on a baking sheet, skin side down, and sprinkle them with the sugar, some olive oil, the balsamic vinegar, salt and pepper. Place in the oven and bake for 2 hours, or until the tomatoes have lost most of their moisture. Meanwhile, place a large skillet over medium-high heat and drizzle in just enough olive oil to coat the bottom. Add the onions and saute, stirring occasionally, until the onions are a dark golden color – 15 to 20 minutes. Set aside. Bring a large saucepan of water to boil. Add the mograbiah and cook it as you would pasta until tender but not overcooked, about 10 minutes. Drain and rinse well with cold water. Drain again. In a separate pot, bring the stock to boil with the saffron and a little salt. Add the (small) couscous, give it a stir, then immediately turn cover the pot and turn off the heat. Let stand for 5 minutes, then use a fork to fluff up the couscous. In a large bowl, stir together the mograbiah, couscous, tomatoes, tarragon, and onions. You will most likely need to add olive oil to keep things from sticking together and a couple good pinches of salt. Turn the whole dish out onto a platter. Scoop some of the fromage blanc over top or crumble one of the suggested cheeses. What a beautiful couscous dish! I don’t roast tomatoes nearly often enough. This looks absolutely beautiful! I’m getting cravings for a dish I’ve never had just looking at it. 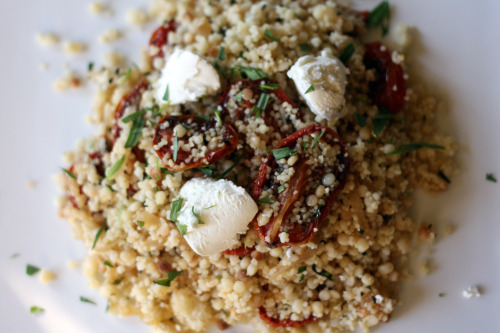 I love these kind of pasta salads….couscous is so lovely, especially w/ roasted tomatoes. Great for the summer season. Yes, gin and lemon on my patio, couscous, you and me. I think we always called this pasta “pastina” but that might just be my mom’s sordid interpretation of the name. I know what you mean about trying to find a varied vegetarian three part meal…it’s rough. You don’t want to completely overdo it on the veggies themselves but you also don’t want carb upon carb upon carb. This dish looks absolutely perfect! I love the sound of it with some feta. I’d love to have a big bowl of this in the refrigerator to nibble on for a few days in a row. The oven dried tomatoes sound fantastic. That’s positively gorgeous. And I love that heady, earthy flavor that the saffron is bound to lend to the dish. YUM. This dish would be the perfect application for all those delicious Principe Borghese tomatoes that we have stashed in the freezer. I LOVE israeli couscous for its texture. I usually sautee cooked israeli couscous with some black mustard seeds, and roasted peanuts. Love this version. Ottolenghi is awesome! 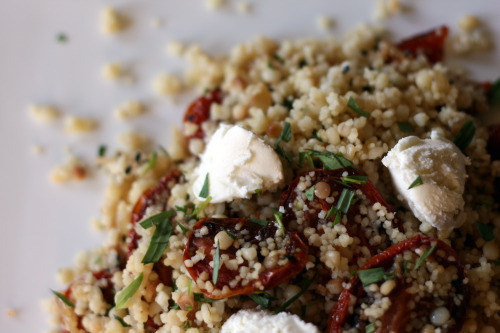 Tangy goat cheese might be good in this couscous. Roasted garlic springs to mind, too. From the perspective of a busy working mother, I like the fact that it makes a lot. I made this last night as a side for a dinner party of 7 and there were plenty of leftovers. Everyone thought it was amazing and so delicious! Thank you for such a simple and yummy recipe!